The Boracay shore excursions will lead you to the pretty small island with only about 7 km length and 2 km width in Philippine, just 315 km away from Manila to the south. It is in the top 10 most beautiful beaches in Asia, the world’s top 25. Be one of the most wanted beaches in the world with the powdery white sand, pristine blue waters, therefore, the first thing you need to experience in this island is soaking up in this paradise beach. Boracay shore excursions will carry the most interesting activities for tourists from helmet diving – underwater diving, banana boating, snorkeling – diving, fly fish, parasailing … Also, we can watch the sunset on the sailboat in White beach, surfing and kite flying on the Bulabog, springboard in Ariel’s point, driving the ATV to go around the island, seeing performances of fire dancing, playing Zipline, tattoo Henna or braiding. 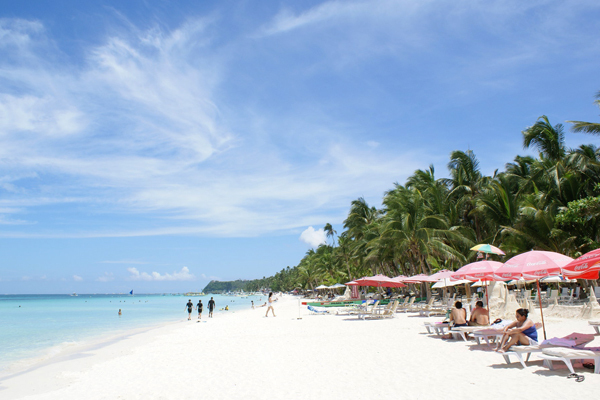 Boracay weather that features a tropical climate with the ideal temperature from about 24-31°C. The finest time to come to Boracay is the dry season, from September to May considered as a peak season with lots of tourists coming to enjoy the wonderful landscape of tropical beach. The remaining time is the typhoon season in Philippines with unexpected storms. Boracay offers a variety of choices for foodies from the traditional cuisine of Philippines to the cuisine of countries in Asia, Africa. In the small road along the beaches of Boracay is the long line of restaurants, pastry shops, coffee with many famous brands of the world, enough to delight your choice. The one thing you should remember is to learn carefully the price of the services and not forget to pay the price when buying something. Do not miss any of the highlights of Boracay with Asia Shore Excursions. Please contact us to get the best Boracay shore excursions. If we have ever doubted the popularity of Boracay, an island among 7,000 islands in the Philippines – the best place for island hopping experience, it quickly evaporated as soon as when walking along White Beach. 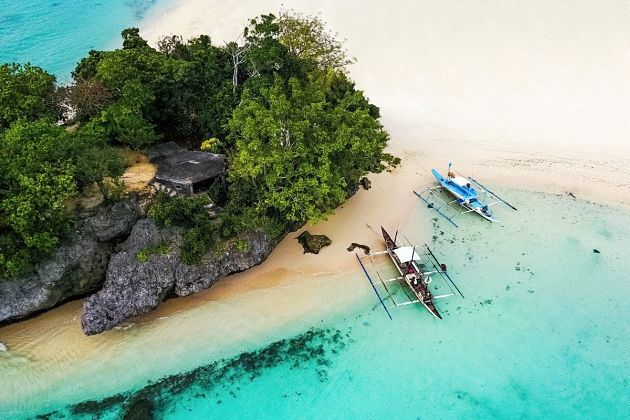 Come together with Boracay shore excursions, tourists will be surely overwhelmed by a pretty small island with only 7km length and 2km width in the Philippines, just only 315 km away from Manila to the south. This Boracay island is a picturesque getaway for honeymooners and a bucket list place for kite surfers. To help tourists get closer to an especially vivid sea life in Boracay shore excursions, we have already suggested a list of things to do & see in Boracay. Do you know that Paraw is the typical sailboat in Philippine? 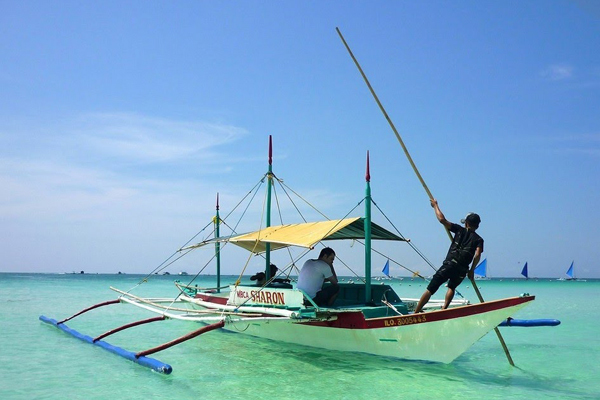 The boats consist of two sails and two outriggers which at least a couple of people hopping on, they have to get hands-on sailing in a traditional way by themselves and then explore the great sites around the Boracay island. Remember to note that in the windy days, heavy waves can kick up a bit, but also brings us an exciting feeling. Travel to spectacular Boracay island, the sunset here is really a fabulous sight that tourists cannot miss. The moment at the end of a day to relax and enjoy the warm sea and enjoy the transformation of the sun from magical red to yellow-orange then becomes gradually blurring in the dark night. 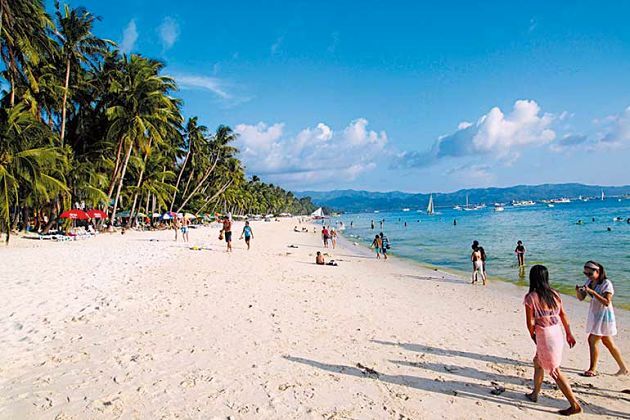 Boracay shore excursions is a tiny island, on-top ten of most beautiful beaches in Asia and top 25 in the world. 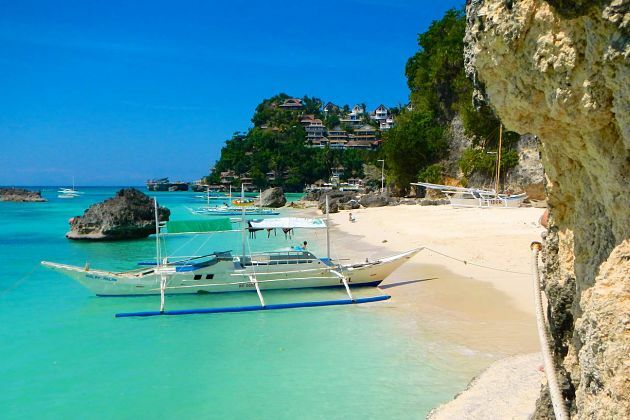 There are certainly many reasons why Boracay is the only Asian beach standing on the top 25 of the world. Blow your mind into the light winds, with the stunning white sand, pristine blue waters and under the splendor sunshine, the first thing you must undergo is dipping your body into this heaven. The Boracay hopping tour allows visitors to join a plenty of fantastic activities from helmet underwater diving, snorkeling – diving, banana boating to parasailing. How marvelous they are when admiring the sunset on the beaches’ side, which must be the sights that you have ever seen. When the night falls, tourists have a lot of things to do with the locals like traditional performances around the huge fire or watch they play, sing folk music and dance. 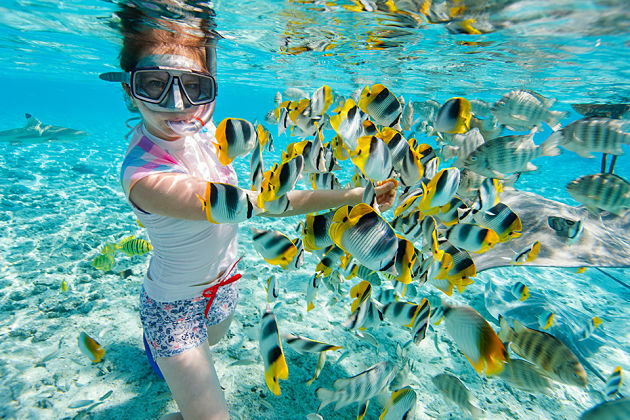 Boracay Hopping Tour allows tourists to swim and snorkel, which make a deep experience into the underwater world with a plenty of sea creatures. Right then, tourists might interest in the majestic natural cave to have an opportunity to live in the wildest dream. After that, your itinerary moves to Puka Beach, exactly a tropical paradise in Boracay island. Go snorkeling in the crystal clear water and discover the wonderful Friday’s Coral Reef and many other colorful different-sized fishes around the Lobster Rock. Take a look at the speedboat off Bulabog Beach and then soar high above the island. Enjoy parasailing, tourists will be overwhelmed by the fantastic view while flying at it. Remember to bring camera by your side to take a shot of this breathtaking view, don’t worry that you may be dizzy, the boat staffs are skilled in taking pictures of flying tourists and nice views. Just after one moment, you were seated at the back of the boat, right then you were high up in the air. It must be fancy when the cool wind blew away from the boat, and you were surely brought to the juvenile years. These childhood memories brought back, it’s like a short film as you did all weekend running across a cleared field and flies a kite but this time is different since you are the kite. 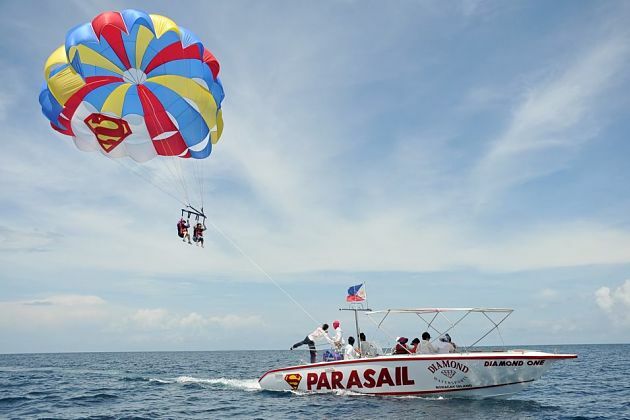 Parasailing in Boracay must be the best thing to do in your Bocaray hopping tour. 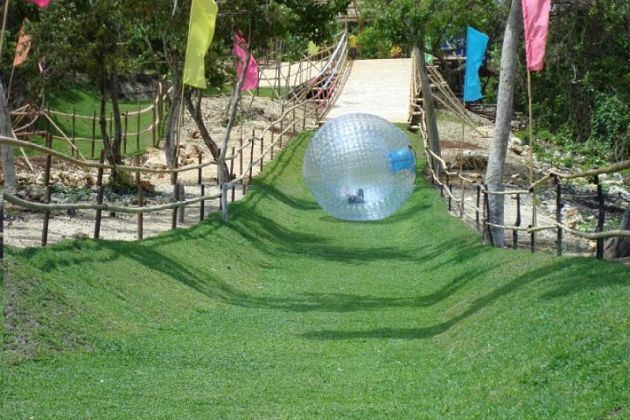 Have you ever tried zorbing? And have you been curious about the way it works? It is a huge ball sitting at the peak of a quite steep hill, and there is one person climbing inside that ball, sealed up and then hurled down a ramp, careening through a grass path like an amazing outdoor bowling ball. When the ball bouncing, at the bottom of the hill, your team members are already lying in wait to be run over the huge rolling zorb, which sounds crazy! 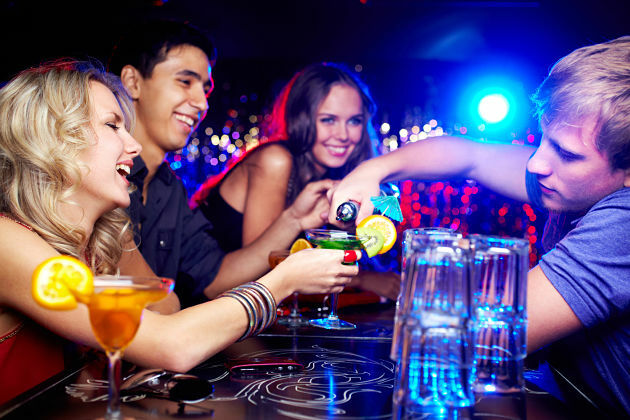 If you want to meet some new friends on Boracay island, and get a lay of the land to discover the best pubs, or even get free shots and free Boracay T-shirt, the pub-crawl is so awesome for your needs. The Boracay Pub Crawl has been running for almost 10 years now and it has no intention of slowing down any time soon. Join the crew by crawling to 5 bars, playing many games and drinking at each stop. Come to this pub tourists will be impressed by the cool slogan used with the hashtag ‘turning strangers into friends’, and this hashtag is so true. Actually, the rest of the trip, you will have more partners to hang out with and obviously new buddies to go together and explore this wonderful Boracay. 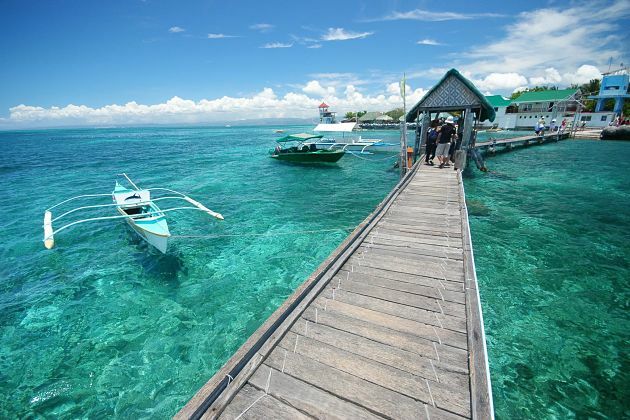 The average temperature of Boracay - a tropical climate island - is about 30 degrees Celsius and the humidity is 75%. 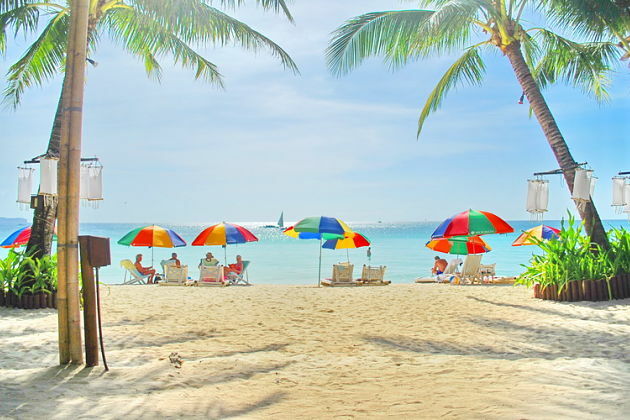 Boracay weather is defined by two main seasons a year: the dry season or called Amihan lasts from mid-November to May which is the most crowded period of a year here and rainy season also called Habagat from mid-July to November considered the off-peak season in Boracay. Best time to visit Boracay is obvious on the dry season when the weather in Boracay Island is so warm and dry. It is so paradoxical but true when saying that both the coolest and warmest months of the year are in Amihan: December and May respectively. On the other aspect, October is the wettest month in Boracay. It is necessary to note that weather in Boracay, like the rest of the world, the climate has gradually been changing in the past few years on the island. To take an example, short rainfalls can occur until the end of December when they might previously stop completely in November. The temperature during dry season fluctuates between 25 degrees and 32 degrees Celsius. The hottest months are April and May when the temperature can be up to 39 degrees. Therefore most visitors not only foreign tourists but also local ones swarm here this time due to long vacations in summer or Christmas Eve. Especially for those who love the cool and fresh atmosphere of the beach, this hottest season of Boracay weather in a year makes the sea with lucid water and powdery white sand even more attractive. For watersport-lovers, this is the most favorable time to investigate Boracay beaches because almost all 25 main dive sites are open to welcome tourists from Boracay shore excursions and the Boracay weather conditions are really suitable for water-related activities. Besides, many festivals, competitions, and concerts are also held during peak season. 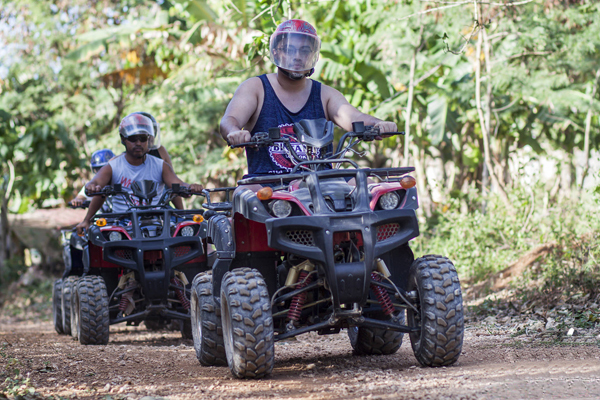 So, you don’t have to worry about not having anything for recreation if you are not very keen on water activities. Therefore, make sure that you have booked the hotel in advance or you may have a tough time finding accommodation. In rainy season also known as typhoon season in Boracay, the sky is often cloudy; there are frequent breezes in the air, and rain showers are more prevalent. 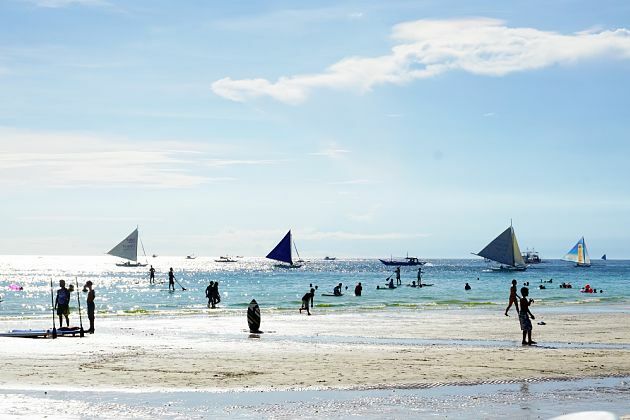 When people might think that they shouldn’t visit Boracay during this season, it is getting more and more popular for backpackers and Boracay shore excursions’ tourists to travel to this period of time. The island is naturally protected from a strong storm, therefore, it is rarely influenced severely. Because it is much less populated here in lean months than in peak months, you can discover another perspective of this lovely island. 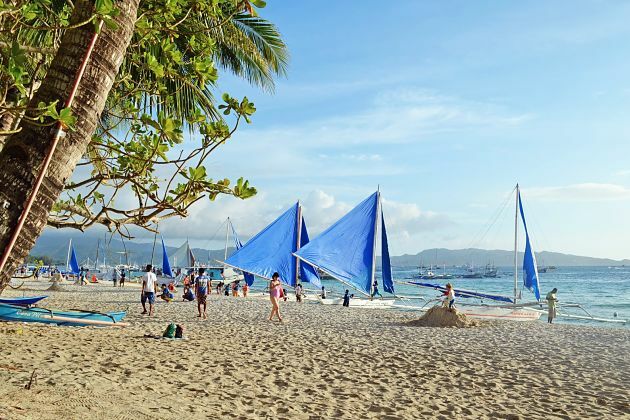 If in the dry season, Boracay is well-known for its dynamic lifestyle and various activities, then in the rainy season, you can’t miss the moment of sunset in the beaches. It is the most gorgeous and witness-worthy moment that may enlighten your travel. Or if you want to make a getaway from your vibrant city life, Boracay in off-peak months is absolutely a great choice because you can enjoy peaceful, uncrowded beaches here instead of having to jostle the crowd when visiting the place like in peak season. And the provided service such as water activities, spas and hotel will be much more amicable even at the same price. Hence, for whatever purposes – getaway from hustle life, water activities or sightseeing, Boracay hopping tour is still a promise destination to explore, a gem no matter in dry or rainy seasons. Once undergoing Boracay shore excursions, you are sure to be irresistible to come back again.